Town centers are complex organisms that require a lot of thought and planning to achieve their quality of life and commercial goals. Many have failed. SN has tried to evaluate the conditions for town centers at various locations in North Central Austin. 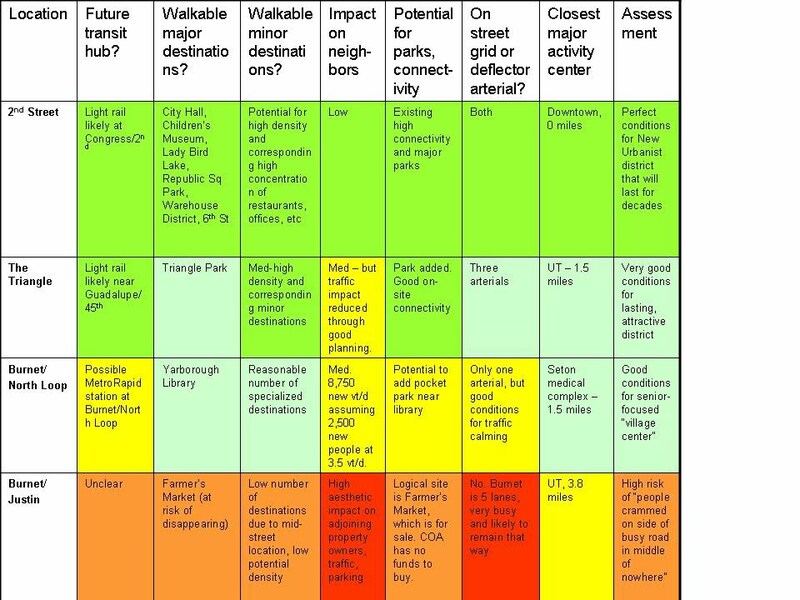 Below is a gap analysis comparing two sites on Burnet as well as The Triangle and 2nd Street. Underscoring all of our analysis is this question: "Will people really want to live here?" For a narrow mid-corridor location like Burnet near Justin, several paths are possible. The City could recognize the area as at risk, and commit resources like park space in advance that will support the district's quality of life. Given the high cost of land along streets like Burnet, however, this may not be feasible. Parks are needed most where density will be highest, at town centers built around major transit hubs. Alternatively, the area could be zoned for live-work, thereby focusing people with lower-than-average travel needs and higher-than-average vested interest in the community. This strategy puts "eyes on the street" all up and down the corridor, while lowering the risk that areas with lower quality of life will self-select low-income people and become segregated from high-income people. Click to see SN's gap analysis for all of Burnet and Anderson. Click to see graphic of Burnet/Justin area with risks identified.